Discover the best spots for ice climbing in Japan and get some inspiration from people who traveled there with certified mountain guides from our Explore-Share community. Extremely cold temperatures, heavy snowfalls and amazing powder snow have turned Japan into a world-class skiing destination, with more than 600 ski resorts spread over the country’s mountains. However, little is known about ice climbing in Japan, a unique winter activity with huge potential, offering interesting spots on the island of Hokkaido and also in Nagano. One of the major struggles for travelers interested in this activity is finding information in English, as well as English-speaking guides who can help them organize their trip and guide them through the depths of mountains to the unpublicized locations. At Explore-Share, we love to connect you with professional mountain guides from all over the world. 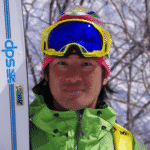 That’s why we’d like to introduce you to Takao Miyashita, an IFMGA mountain guide born and raised in Hokkaido. He is a professional climber and skier, who enjoys planning the best outdoor experiences for his clients. “Takao-san is definitely a 5/5, a guide with great experience and good technical knowledge”, says Sonny Mai. Last winter, he and his friend Denise traveled from Tokyo for a 2-day ice climbing trip in Sounkyo, together with Takao. In the north of Daisetsuzan National Park (the largest protected area in Hokkaido), you’ll find Sounkyo: a touristic hot-spring resort, close to a giant gorge at the foot of Mt. Kurodake. Besides its popular onsen baths, Sounkyo offers captivating rock formations, waterfalls and cliffs surrounded by a deep forest. During winter, these waterfalls freeze into ice falls: a true paradise for ice climbers! An iced waterfall in Sounkyo gorge. For Sonny it was his second time ice climbing, while his friend Denise had some training as an indoor rock climber. Usually, having rock climbing skills helps to make faster progress on the ice, advises Takao. Thirty-one year old Yi Chung Law, from Singapore, and his wife were also guided by Takao in Sounkyo. Yi Chung Law has a rich climbing experience in the Alps and an aspiration to become an independent ice climber. He had only been ice climbing once before, at a 6 pitch cascade in Champagny-en-Vanoise. Yi Chung, during his ice climbing trip in Sounkyo. On a 2-day trip, they visited two waterfalls in Sounkyo: Ginga no taki (Waterfall of Galaxy) and Kinshi no taki (Waterfall of Tinsel). On the first icefall, they did single-pitch practices on a harsh cold day with strong wind; while the second one was a 4 pitch climb. For Yi Chung, “the two waterfalls were beautiful and it was a privilege to climb them, specially Kinshi which has a spectacular first 30 m pitch. It was probably my favorite!”. Despite Hokkaido’s extreme temperatures, they are already planning to come back: “Takao said that there are routes by the sea. That would be really interesting to try out on our next visit!”, Yi Chung says. The ice climbing season in Hokkaido matches the powder ski season (from the end of December to February). That’s why adding 2-3 days for ice climbing in between your ski trip can be a fantastic idea! We’ve already mentioned Sounkyo gorge, a scenic playground with more than 10 frozen waterfalls at a 3 hour drive from Sapporo, the largest city in Hokkaido. This is a suitable option if you are a beginner or an intermediate climber. If you are looking for a more technical and challenging route, Takao recommends a secret ice climbing spot only 1-hour away from Sapporo. Here you’ll find 4 different icefall routes of around WI4+ grade in the ice climbing grading system. Approach to some icefalls requires a river crossing! Finally, for an advanced ice climbing trip in Hokkaido you should head to Raiden, a unique destination by the coast, very close to Niseko and 2 hours away from Sapporo. Tim Case, a rock climber from the US, went on a 2-day ice climbing trip near Sapporo. A quick google search for “ice climbing Hokkaido” fortunately led him to Takao’s page on Explore-Share. Tim had taken an ice climbing course near his home in Colorado, but he wanted to experience this exciting sport in a different country. “It was fun to see a different part of Hokkaido in a unique way. The second day was a 2 pitch route next to the sea. The exposure and the area were very impressive”, he says. Tim, on his trip with Takao this winter. Ice climbing is also possible in Nagano prefecture, in the Yatsugatake Mountains, 150 kilometers away from Tokyo. You can join a certified mountain guide for an introduction to ice climbing in Mt Akadake, the highest peak in the area, or for 2 days of ice climbing around Yatsugatake. Besides ice climbing, travellers will be allured by the unique Japanese culture and delicious local cuisine. “We love Japan and have a huge respect for the Japanese people. They are polite, organized, professional and have some of the best food in the world”, says Yi Chung. However, travelling to an unknown destination can be a tough challenge: knowing the best spots to go, planning the logistics of the trip and even understanding the local language can be hard unless you have the right guidance. In this sense, going with a certified local guide is for sure the best choice. “Takao-san has a lot of experience guiding and climbing. He did an excellent job making me feel safe and sure about what we were doing. His technical skills and his knowledge of the area were key to make the experience a success”, says Tim. Yi Chung describes Takao as “very friendly, gentle, patient and genuine”. “We slowly learned that he is one of the most experienced mountaineers and guides around in Japan”, he says. He also remarks on how important it was that Takao could speak well in English. Thanks to that, they were able to have simple conversations and understand his instructions on the ice. Ice climbing consists of ascending a vertical ice wall, usually a glacier or a frozen waterfall. Unlike regular rock climbing, it takes place in an unpredictable terrain: an ever-changing ice surface. Ice tools (technical ice axe) and steel crampons with vertical front points are the essential equipment for ice climbers. Other important gear are mountaineering boots (adapted for crampons), ice screws, quick draws, helmet and a harness that will be attached to one or two ropes. Besides that, it’s also necessary to wear suitable winter clothing, as temperatures in Japan are usually very very cold! “I think Explore & Share is doing a great job in developing the Japanese climbing scene and opening opportunities for foreign climbers like myself. Overall, I’m optimistic that there is much potential and I look forward to coming back”, says Yi Chung. In Japan there are ice routes for all levels of difficulty. Whether you are a climber seeking to hone your skills or a beginner, you’ll find one that suits you. Like Yi Chung and other travelers did last winter, you can also start planning your next adventure on the ice! Join Takao on the popular Intro to Ice Climbing in Sounkyo, Hokkaido or take a look to all the ice climbing programs in Japan. An amazing country full of winter sports possibilities is awaiting you. Still need some extra inspiration? Read about Cogne, a great destination to start ice climbing in Europe.